The Don Julio brand has been perfecting tequila since 1942. They never stray from making only quality tequilas; and only release their product when it has met their standards. 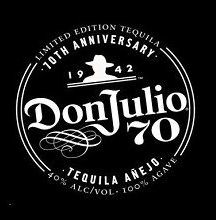 Don Julio 70 is their 70th Anniversary Special tequila. It is an Añejo Claro; meaning: the tequila is barrel aged for a 18 months, then filtered to dial back the barrel taste a bit and bring back the near total lack of color. So, a Blanco look with an Añejo taste. While the Maestro Dobel brand is a relative newcomer to the U.S. (est. 2008) its heritage as a Jose Cuervo label stretches back to the dawn of tequila distilling. Maestro Dobel is an “ultra-luxury” brand. Maestro Dobel Tequila is a Blended Claro; meaning: they’ve blended Reposado and Añejo tequilas, then filtered them to dial back the barrel notes and bring back a near-clear color. In this case, they’re calling it a Reposado; so: A Blanco look with a Reposado taste. Any fight must be judged by a panel of 3 or 5 to ensure there is no tie. This time around, The Booze Guru is accompanied by his Super-Taster Wife Kari, and his BoozeHunt Buddy Dan. You might be thinking: “BoozeGuru! Shame on you for comparing a Reposado to an Añejo!” But hold on a second, ok? Bear with me. The Contenders in Today’s Bout! You might also be thinking: “Wait a second! You preach that whole ‘no aged tequilas’ thing! You hypocrite!” Which is… really harsh, man. Sheesh. What did I ever do to you? Actually, I preach ‘The only tequila is clear tequila’… and these are both clear. Ok, seriously, just because I don’t keep it in my house, doesn’t mean I can’t appreciate it and rate it. Tequilas were sampled in clean, double-rinsed brandy snifters. Fresh lime and coffee beans were available to clean the Judges sense of smell. Plain water crackers and double-filtered water were available to cleanse their palates. Prior to smelling these two, the panel of Three Judges did have some preconceived notions. We were expecting barrel notes on the nose, perhaps some real agave scent, and a dash of spice. What did we find? Maestro Dobel bobs and weaves its way in with a mild astringency. Barrel notes follow this: mild oak and a touch of vanilla. Rounding out the scent is a hint of caramel sweetness. Round One’s Winner: Maestro Dobel. The score cards have it 3 to 0 in favor of Maestro Dobel’s lower astringency, real barrel notes and more complex profile. Now that we had a scent, the Judges were curious! Would the taste match the scent? What deviations might there be? Which would exhibit real Resposado & Añejo flavors? Don Julio 70 delivers a wicked right cross in the form of true barrel tastes. Mild oak, slight vanilla and cinnamon, all danced across our tongues. That “tequila bite” we were all expecting because of the astringent nose was there, but mellow. Maestro Dobel hits with a One-Two combo of citrus and prickly pear; a real agave flavor. But the oakiness of the nose never made its presence known on our tongues. Zero “tequila bite” was present. Round Two’s Winner: Maestro Dobel. The score cards have it 2 to 1 in favor of Maestro Dobel’s true agave notes and zero bite. HOWEVER, all Judges agreed: Don Julio presented a “true aged tequila experience” with its mild bite and barrel notes. But in the end, Maestro Dobel’s smoothness won out. Feel & Finish come right on the heels of Taste. How was the mouth feel? Any oiliness? Did either coat the mouth and tongue? How was it at the back of the throat? Any off-putting after tastes? Don Julio 70 goes down with a caramel & vanilla finish. The barrel notes of the flavor continue with the finish. However, all the Judges noticed a mild oiliness in the mouth feel. Mellow warmth from mouth down the throat. Maestro Dobel hits the gullet smoothly. Sadly, it’s a tad too smooth. Only a mild warmth as it goes down; no real finish flavors were present. Round Three’s Winner: Don Julio 70. The score cards have it 2 to 1 in favor of Don Julio’s barrel-flavored finish. 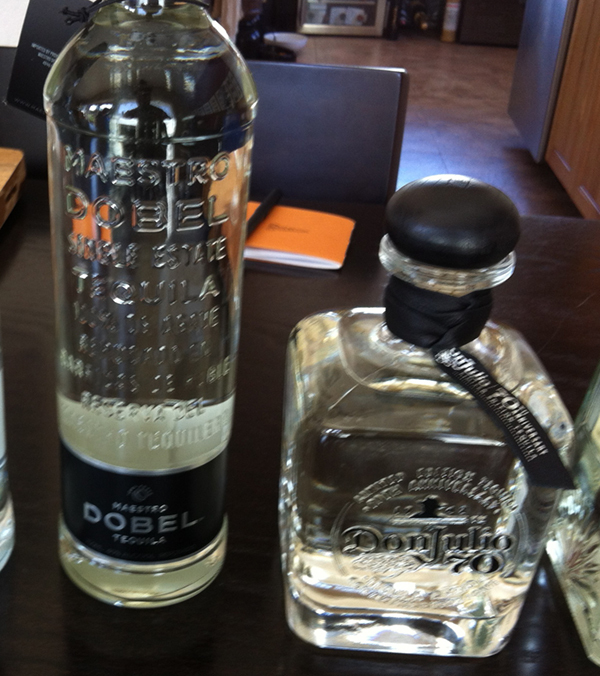 While it might seem that Maestro Dobel was the clear winner… it’s not. Both tequilas are really nice and I’d be happy to have them both in my collection. They serve different purposes. One would be a fantastic sipping tequila, just a tad of ice. The other would make the world’s best Margarita. And no… I’m not telling which is which! Both Don Julio 70 and Maestro Dobel are winners in my book. If you can find Don Julio’s Limited Edition 70th Anniversary Tequila, it will run about $60 a bottle. Maestro Dobel is only available at finer liquor stores and will run about $45 a bottle. Maestro Dobel is actually a blend of a 12 month Repo, 2 year Anejo, and a 3 year extra anejo. Far better value then the Don Julio. I do say in the Versus Review that Dobel is a blend of Reposado and Anjejo tequilas. “Extra Anejo” is a new-fangled term made up by marketers.